Imagine that you’re the parents of four children under the age of eight. Your home is strewn with stuffed animals and sippy cups. And, if you’re a couple named Colby and Lacey (a real couple from Utah), you keep drug paraphernalia next to the bassinet and smoke heroin in front of your children. For the life of me, I don’t know why anyone who is an addict would decide to become a parent and bring an innocent child into his or her sick drug den. My only conclusion is that some parents figure someone else will raise their children while they do drugs, drink, party, commit crimes, Snapchat, plant fake crops on FarmVille, and do anything but parent. They’d rather have the latest and greatest iPhone than help their children figure out eighth-grade algebra. Thankfully, that’s not most parents in Louisiana, but it describes too many. Life is precious. Anyone who’s looked into a newborn’s innocent eyes should realize how incredible it is to be blessed with a new life. That couple named Colby and Lacey allegedly gazed into their newborn’s eyes and then rubbed drugs into the child’s gums to hide the fact that she had been born addicted to heroin. Nurses say some parents do this all the time to hide their infant’s withdrawal symptoms. Here’s my advice to couples like Colby and Lacey: Stop having children if you don’t plan to raise them. A lack of good parenting sense isn’t just a problem for Colby and Lacey. Last month, an eight-year-old girl tested positive for cocaine in Baton Rouge, after a relative brought her to the hospital because her mother refused to do so. When authorities located the mother, she had cocaine and drug paraphernalia in her possession. My heart aches for that child. At eight years old, you should be playing games, painting your fingernails purple, getting glitter on everything, and learning how to bake cookies. The last thing you should be doing at that age is testing positive for cocaine. I don’t know that mother’s story, but I do know that she failed her child. Too many parents are failing their children these days in Louisiana. Thousands of children are in the state’s foster care system. A woman in West Monroe was just honored for mothering 100 foster children over the years. Think about that: That one woman had to do the parenting for countless parents. Too many people treat parenting like it’s the 20th item on their to-do list. Their social life, drug habit, and sleep schedule matter more to them than their children do. Talk to teachers and they’ll tell you: Children show up unbathed, unfed, and unprepared at school, when they show up at all. Sometimes the system catches them and shuffles them into a foster home. Tragically, sometimes the system fails them like their parents did. It’s not fair to those children, and it’s certainly not fair to our communities. Those children grow up broken. They don’t glue themselves together and get a scholarship to LSU. They often drop out of school, do drugs, commit crimes, and hold down minimum-wage jobs. They’re flushed down the toilet before they’re potty trained, and then taxpayers are left to take care of them. Studies of high-performing schools tend to find a common thread: parental involvement. Those same studies show that the more interest you have in your children’s education, the better they do in school. The Southwest Educational Development Laboratory found that a family’s income does not determine how well kids score on tests or how often they show up for school. The determining factor is parental involvement. Abraham Lincoln is a good example of the benefits of parental involvement. Lincoln easily could have died an illiterate farmer. He grew up on the frontier, where schoolteachers made sporadic appearances, and lost his mother at a young age. An uneducated woman named Sarah Bush turned the tide for him. Sarah married Lincoln’s father and encouraged a rather feral Lincoln to nurture his love of reading. She thrust books in front of him. She ensured that he had a comfortable home and treated him like he was her natural child. That’s good parenting, and it helped shape Lincoln into one of this country’s greatest presidents. But you don’t have to raise a future president. You just have to raise a child who has a little common sense, graduates from high school, and stays off the road that leads straight to prison and drug addiction. We launch public awareness campaigns to encourage people to recycle their soft drink cans, stop smoking, and wear seat belts. Maybe we need to launch campaigns to encourage people to raise their children. Most Louisiana parents don’t need that encouragement. But if we are honest with ourselves, we have to admit that some do. Having children is a blessing. Treat your children like the blessings they are or don’t have them at all. Our foster care system and jails already are at capacity. There’s no more room at the inn. 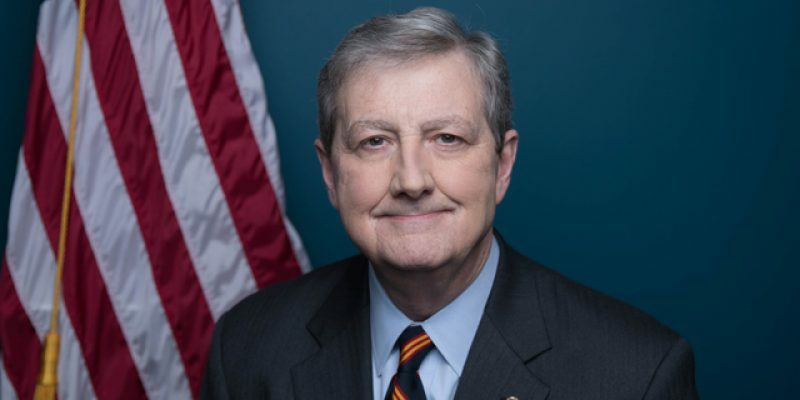 Sen. John Kennedy, R-La., was elected to the Senate in 2016. This piece originally appeared at The Washington Examiner.